This article will share partition magic software to add unallocated space so as to extend C drive on Windows XP/7/8 and Windows Server 2003/2008/2012. Download IM-Magic Partition Resizer Server to extend C drive with unallocated space on Windows Server and other Windows operating systems. 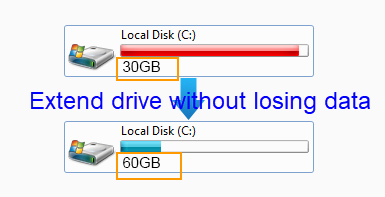 Want to add unallocated space to increase the size of C drive? You can run Diskpart to extend C drive on Windows Server 2003 if operating system is not installed on this drive. You can open Disk Management on Windows Server 2008 and Windows 7 to extend C drive if the unallocated space is right behind it. However as a matter of fact, it could be much easier to extend C drive on all Windows OS with help of a third-party partition magic tool IM-Magic Partition Resizer Server. Download, install and launch IM-Magic Partition Resizer Server. 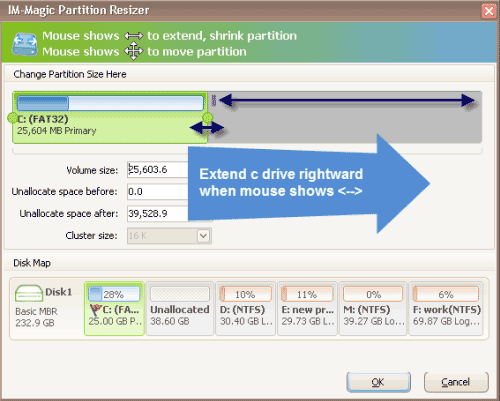 Right click a partition that has enough free space and select "Resize/Move". Move the arrows to shrink the selected partition to squeeze some free space. The free space will be shown as unallocated volume. You need to move the unallocated volume close to C drive. Then, right click C drive and select "Resize/Move". Move the arrows to add the unallocated volume to C drive and then click "Apply" button. For most home users, they often like to install Windows XP/7/8/Vista system. IM-Magic Partition Resizer Server is free Server partition magic software, but it is also available on Windows XP/7/8 operating system to extend C drive as long as there is unallocated space on the same hard disk. Even if there is no existing unallocated space, you can run the IM-Magic Partition Resizer Server to shrink the partition that has enough free space to squeeze some unallocated space. Besides, IM-Magic Partition Resizer Free is specially designed for Windows XP, 7, 8, and Windows Vista users to resize disk partition without any limitation. Windows Server 2003 is Server operating system, so you can only rely on Server partition software to extend C drive. IM-Magic Partition Resizer Serve can work on Windows Server 2003 OS to resize hard disk without repartitioning or reformatting hard disk. The partition software can not only extend C drive on Windows 2003, but also it enables you to extend C drive on Windows 2003 R2 and SBS 2003. You can extend C drive on basic hard disk and RAID 5 without reinstalling system. In addition, the partition software also supports to extend C drive on Windows 2003 VMware. As mentioned above, IM-Magic Partition Resizer Server supports to extend C drive on RAID 5 and extend partition in VMware disk. No matter you want to extend C drive on RAID 5 disk or extend partition in VMware, unallocated space is needed. If there is no free space on RAID5, you can add another disk to extend the RAID 5. The partition software works the same on Windows Server in VMware. You can extend C drive, system partition, boot partition and primary partition on Windows Server in VMware without losing any data or having any influence on the OS.